There are very few accessories I like as much or more than dainty gold pieces (I’ll take all of the Oscar de la Renta tassels, thanks!). While statement jewelry is a fun choice for certain looks, it’s often too bold for everyday wear. When looking for jewelry I can wear day-to-day I search for two things: simplicity and the ability to layer. Gorjana masters both of these traits like nobody else I’ve seen, and at an amazing price point. I’ve been a fan of Gorjana for years – if you’ve been reading this blog from day one you may remember my first giveaway was a pair of Gorjana earrings! Her pieces are timeless and look good at every age. I recently had the opportunity to pick out a few new pieces from Gorjana and I chose the Fancy Dagger necklace and the Aurora necklace. As you can see, they look beautiful layered together as they are varying lengths and the different textures add a little depth to the look. I wear my Gorjana Teagan ring almost daily now too – it’s a great basic. Some other pretty layering necklaces I recommend checking out include the Taner bar necklace, the pressed Taner layered necklace, and the longer version of the Fancy Dagger necklace. Don’t forget to explore their incredible selection of rings too! I have this midi ring set and this cuff ring in my shopping cart. Love this classic Chanel, you look so summery. Simple & chic – love the dainty feel to that necklace! head to toe perfect!!! I love the classic outfit, and the delicate layered Gorjana jewels are so pretty. Black & white & gold is a fave of mine. Gorjana is one of my favorite places to find dainty gems. 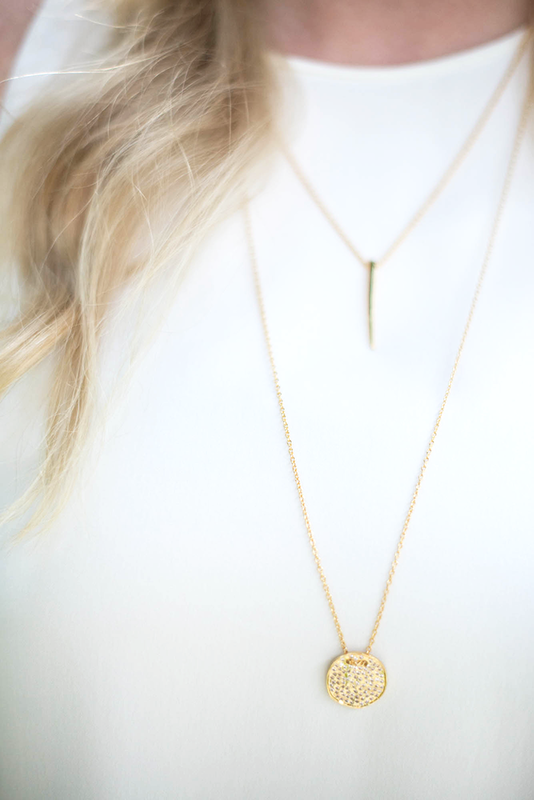 Love these layered necklaces on you! Gorjana has some of the best dainty pieces out there! Courtney’s collection for them is amazing, too! Loving the simplicity and daintiness of this all – classic and beautiful! I love Gorjana but still have yet to purchase some pieces. I will have to check it out!! Drooling over that Chanel bag! Have a great Monday, Merritt! Love the pieces that you picked! The dagger is esp my fav!!! I’ve never bought any Gorjana! Going to check out their website now!!! Love this simple look! So pretty Merritt! Gorjana makes such pretty pieces. I love the ones you’ve layered here! They are prefect with this simple, yet chic outfit! I’ve been obsessed with simple black, white and gold outfits so far this summer!! These dainty necklaces are perfect. I can’t deal with heavy, chunky necklaces in the heat! I love those necklaces!! The white top looks gorgeous on you! Love the simple black and white and LOVE the sandals! Love the layering of the necklace and the rest of the gold detailing. Those sandals are also gorgeous and they look very comfortable! 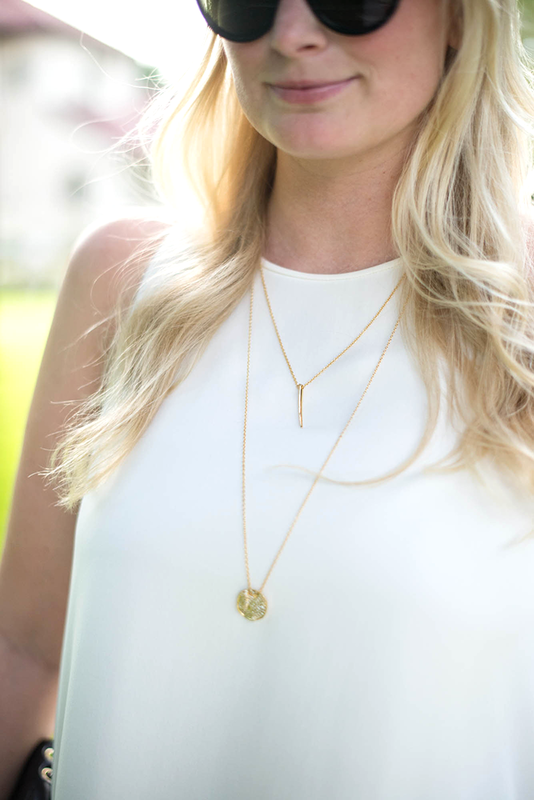 I am all about simple gold jewelry during the day, so simple yet beautiful! I love that long Aurora necklace! Love the accessories and your top! I am totally with you, sometimes dainty is better than statement. I love the layered gold necklaces, Gorjana has the best stuff. 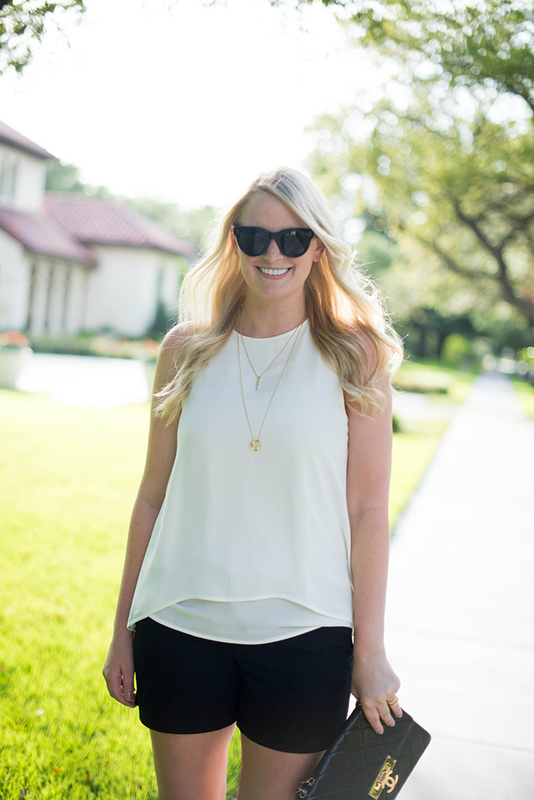 I couldn’t agree more with you about dainty gold necklaces! They have been on repeat for me and now I need these two options! I love your gorgeous chanel bag! Love black & gold, love this ensemble. Love those sandals–comfy and glam at the same time! Love the gold details against the classic black and white! I love these dainty necklaces, so pretty! B&W surely never fail us! I love the pops of golden in the whole outfit.